Can I add Terminal Server Agents from different domains to my Parallels RAS Farm? If you want to add, Terminal Server Agent from another domain to your Farm, the domain of the machine where Remote Application Server is installed should have appropriate permissions for domains in question. With such infrastructure adding farm members from different domains is possible. 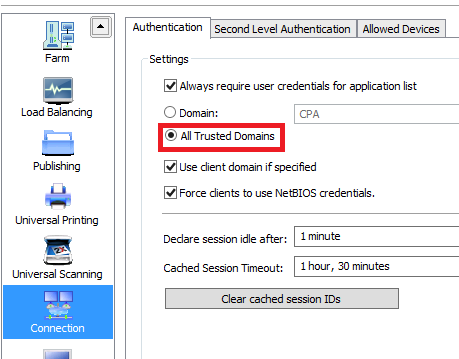 The setting that needs to be enabled is located in Connection > Authentication > select 'All Trusted Domains". If there is no trusted relationship between domains this won't be possible.